The Conservative Treehouse posted an article today that erases any illusion anyone might have had that there are two political parties in Congress. There are two political parties in Washington–the anti-Trump agenda party and the pro-Trump agenda party, but the Republican and Democratic parties in Congress are generally one and the same despite the show they put on that they are different. 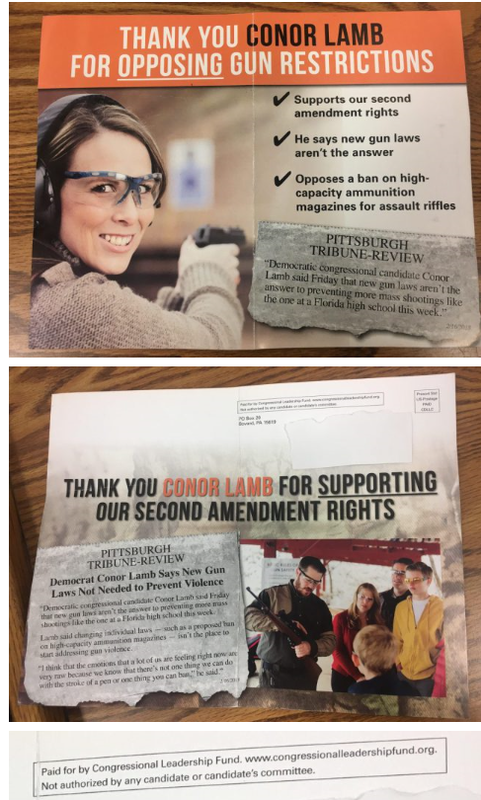 Now, a stunning discovery surfaces of Paul Ryan’s Congressional Leadership SuperPAC, congressionalleadershipfund.org, actually campaigning for the Democrat, Conor Lamb, in the recent PA18 congressional race. The real motive, based on an honest review of history, is the professional UniParty apparatus knew that Democrat Conor Lamb needed a lift to offset the cross party voting that was reflected in the district voting (by over 20 points) for Donald Trump in 2016. It really is about money–in Washington power is measured by how much money you control. The more of taxpayers’ money Washington can seize and control, the more power they have. That’s why the establishment opposes the tea party movement and that is why the establishment opposes President Trump. The only threat to the financial interests of the GOP is President Donald Trump remaining in office and having to actually face carrying out a conservative Trump agenda in 2019 and 2020. That Trump agenda is entirely against their “establishment republican” interests. The Paul Ryan mailer to elect a Democrat is just another example of how corrupt the entire UniParty political apparatus is within Washington DC. Another illustration of the opposition to President Trump is seen in the number of Libertarian and new Republican primary candidates in the current primary season. Many of these candidates are funded by the Republican establishment and are there to replace conservative Republicans who support President Trump with candidates the Republican establishment can control. President Trump is not the perfect President, but he is not part of the Washington establishment and is not controlled by it. If you want to see things change in Washington, you need to support the people who will support the President’s policies. Otherwise, we will have more of special interest fleecing the American taxpayer. This entry was posted in Uncategorized and tagged Conservative Political Action Conference, D.C., Democratic Party (United States), Donald Trump, Republican Party (United States), United States, United States Congress, Washington by granny g. Bookmark the permalink.